Is he ran out of things to talk about on his show. This is why he got into trouble. I guess after doing 870 shows you’re going to start reaching for material. Dr. Oz admitted during his testimony how the only real way to achieve weight loss and good overall health is diet and exercise. That’s it. So when you’re smart enough to know diet and exercise is the only way to live a healthier life but you can make a crap ton of money running a show where people trust your opinion then you’ll probably feel backed into the corner to break down health and fitness to the most boring of molecular levels. This is due to you having talked about everything there is to talk about a number of times already. This is kinda like if Beachbody decided to have their own show where they only talk about Shakeology. They could have 70 different one hour shows talking about each one of its ingredients. Story lines include where it comes from and what it does for you. Doesn’t a one hour show talking about Maca root sound exciting? Not really. Both keep trying to come up with new products to capture their dedicated viewers/customers/coaches to want to buy or try the latest thing. Thats what businesses do. I have an entire shelf of their workouts and I’d say about half are very similar to each other whereas the only difference is the trainer. Beachbody, just like Dr. Oz has to keep coming up with products that serve particular niches as they’ve already came out with very successful broad market products which will always be good. Dr. Oz’s broad product should only be telling people they need to watch their diet and exercise. Beachbody has P90X, Insanity, and Turbo Fire. The health and fitness industry can only talk about it so much before you start to break it down to the most boring of levels and get people excited about a whole lot of nothing. 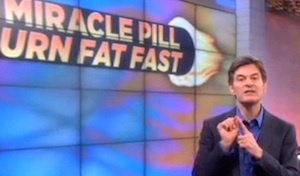 Dr. Oz has built a brand and the show must go on. Could you imagine a show where all he says for an hour is “Diet & Exercise. Diet & Exercise. Diet & Exercise. Diet & Exercise. Diet & Exercise.” That won’t sell. Unfortunately, it should. It should be all a Dr. needs to say.